This hat will be finished with a hand stitched in Leather Sweat Band! Cuenca Grade 10 - means that it is very finely woven similar to a Montecristi Super Fino weave pattern maybe even getting close to a Fino Fino in some cases. Very Nice hat indeed. 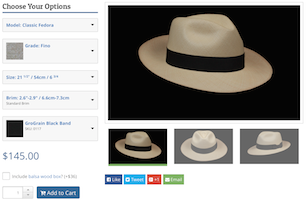 The Classic Optimo Panama hat. Robert Redford and may others used this model. This is the best roll up model, and blocked in standard oval. The standard crown height of the Optimo model is 4" - 4.5" measuring from the brim to the top of the point on the side of the hat. This Optimo Panama hat is blocked on an standard oval hat block rather then a perfectly round one to fit better. Send us your question about this Cuenca Grade 10 Optimo hat, and we will respond to you as soon as possible.